These jeans belonged to my sister and were worn during The Maternity Years. 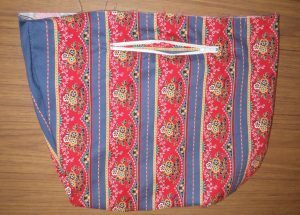 The front waist is cut low with a pretend fly and button, and a wide cotton lycra band around the top (which still has a fair amount of spring in it). All the pockets are real. The back. There’s a tear in the seat which could probably be patched but the other side is looking thin too. The legs are straight cut. 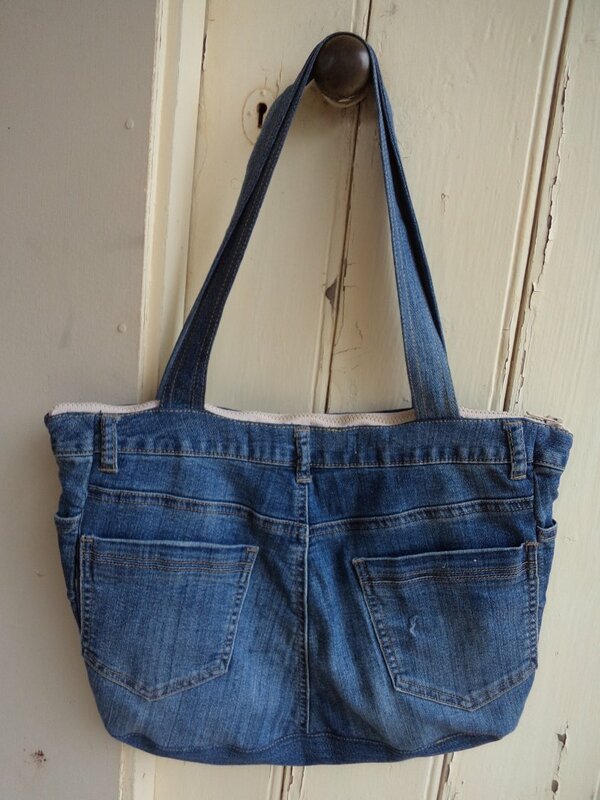 What I have been wanting to make for a while is a jeans handbag, after a friend visited with one she’d made. There are loads of tutorials for making these on the Internet -I didn’t look at these but closely studied Pinterest and Google Images for inspiration. Some people’s bags are pretty fancy! To get started I unpicked the belly band and amputated the legs. I cut up one leg to make a base and handles for the bag. The maternity front turned out to be a bit of a problem because I needed the waistband to be level at the front and back. In the end I cut the base bigger at the front to make up for the missing length, and sewed some vertical darts in to improve the shape. 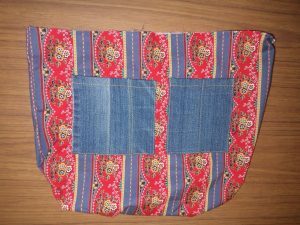 The bag looked too wide for its height, so at the back I sewed in a tuck at each side making the back pockets sit right next to the side seams. 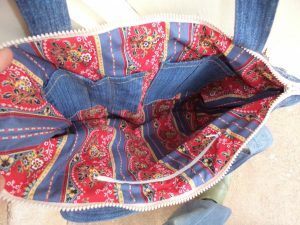 I own a reel of Gutermann upholstery thread in a perfectly matching jeans topstitching colour, and used it to topstitch the front darts, base and handles. It was a great thing to have; I highly recommend getting some if you’re re-fashioning denim. 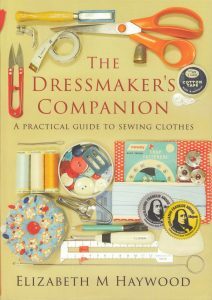 As well as using every part of the jeans, I was also determined not to buy any haberdashery etc. I looked through my zip stash and found a chunky beauty for the top and a smaller one for the lining. I made a lining from some leftover kitchen curtain fabric (it’s quilting cotton). 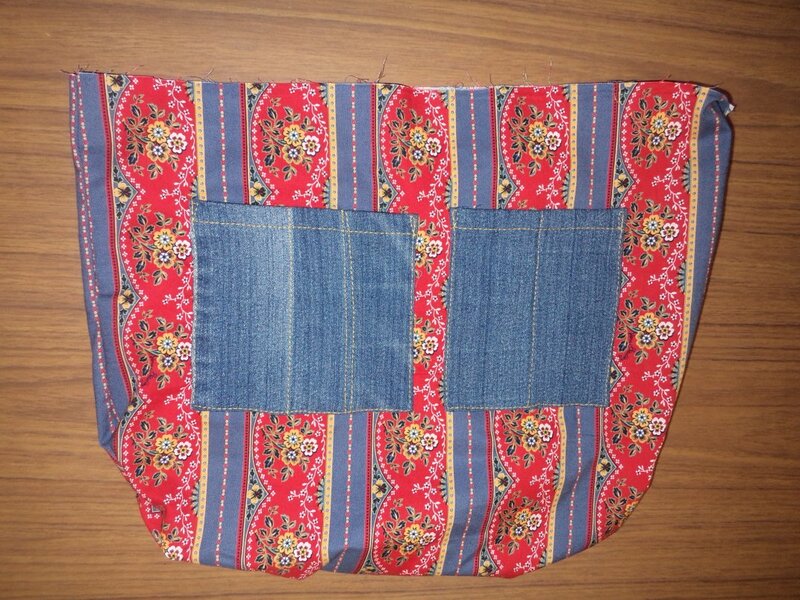 To cut the lining I just followed the shape of the bag, making it the same width and depth. The lining before I sewed it in. 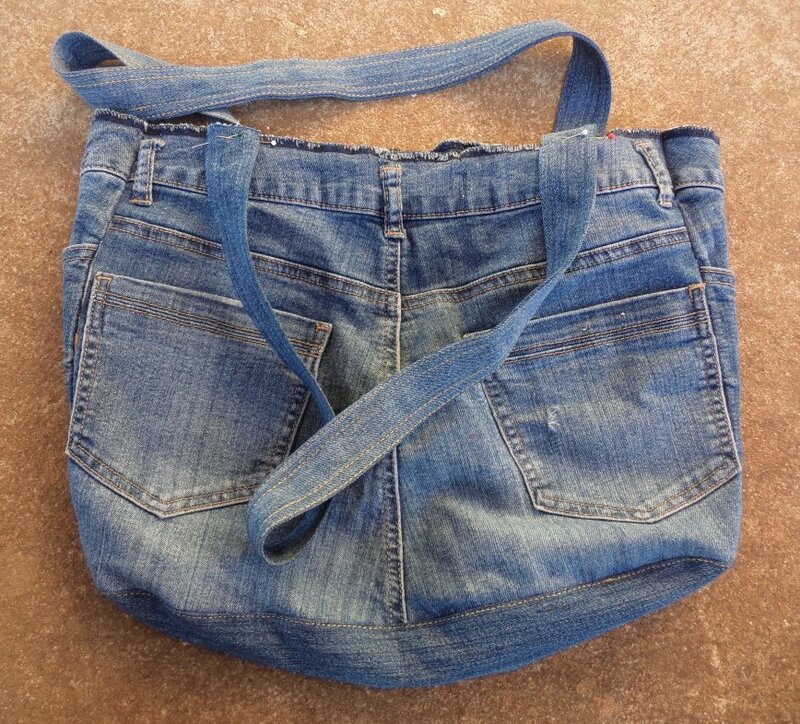 I used some small pieces of denim sewn together to make “keys and camera” pockets. 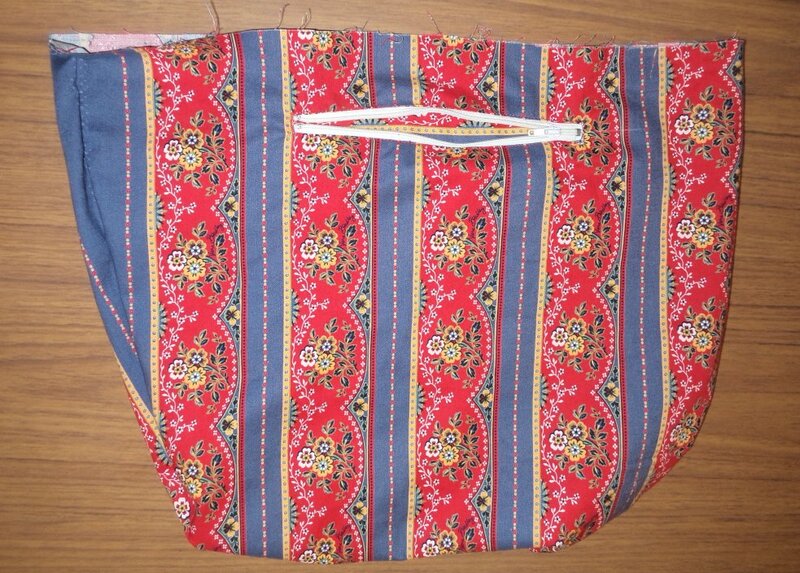 Like to have a zip pocket for the purse. The finished interior of the bag. I handsewed the lining in around the edge of the zip. 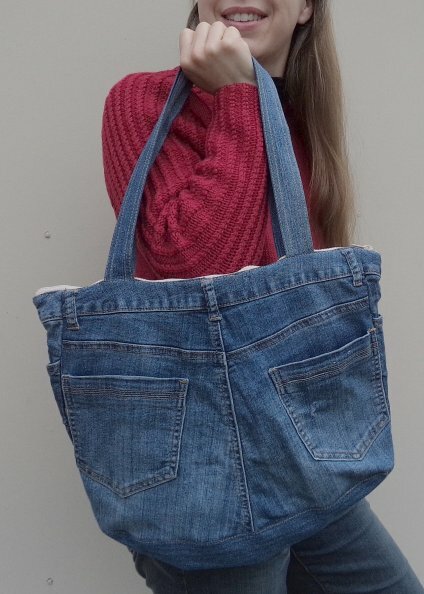 When I finished the jeans handbag I was pretty happy with it! I still had the cotton lycra band and one and a half legs left, which I’ll be “creating with” this week. Join me next time! excellent use of old jeans. Thanks Kay, I think they’ll go on for a few more years now! 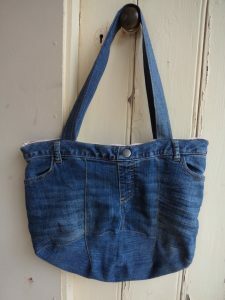 Did you ever see the denim necktie I made from a $2 pair of oversized op-shop jeans? Great for going all out on Double Denim Day. I also thought about making some denim gloves. Maybe fingerless with frayed ends for that extra 80s look. Yes, I did see that necktie. I recall you cleverly positioned a stitched seam across it. Did you ever wear it? 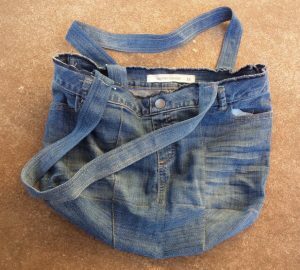 Should be plenty of denim left in the jeans to cut out some gloves -or just make one for that extra 80s Michael Jackson look. Yeah I’ve worn it a couple of times. I have a spare denim leg left I could make gloves from, but perhaps stretch denim would be better. I could make a tube headscarf with stretch denim too. I think I would need some rhinestones for the Michael Jackson look. Perhaps I should pick up a cheap BeDazzler and work on a full ensemble? I would like to hear your fashion advice on this. My fashion advice? Well, probably what happened in the 80’s should stay in the 80’s. However, a glove project would be interesting and I think you would enjoy it. Hi Tom, when is double denim day?